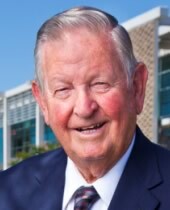 On July 24, 2003, at the age of 77, Bill Cocreham successfully negotiated the donation of the old Sears building on Florida Boulevard to the Baton Rouge Recreation and Parks Commission (BREC). A generous gift from local contractor Milton J. Womack and his associates, the 140,000 square foot building and its 26 acres of grounds are now a thriving hub for BREC’s administrative offices. The renovated facility also includes a centralized warehouse and storage facility, and activity spaces for meetings, classes and exhibits. Passionate in his commitment to expand first-class outdoor recreation and education activities for Baton Rouge area residents, Bill Cocreham brings decades of business and sales experience to the benefit of BREC and its mission. Always on the lookout for opportunities to enhance the quality of life in his community, Bill has orchestrated a staggering number of substantial land and development deals on behalf of BREC, including the Highland Road Observatory and the Santa Maria and Beaver Creek golf courses. Now 85, Bill must be one of the nation’s busiest volunteers, facilitating new and exciting BREC developments such as a wilderness conservation park and a state-of-the-art elephant exhibit for the Baton Rouge Zoo. Bill Cocreham has learned a great deal from life experience and he has deftly applied the benefit of those lessons toward his demonstrated success with BREC. Complementing his thoughtful, exuberant demeanor with exceptional communication and listening skills, Bill’s expertise is widely admired both locally and nationally. Acknowledged by the National Parks and Recreation Association as one of the country’s premier state programs, BREC is a beacon of pride for Baton Rouge and the state of Louisiana. And with Bill Cocreham’s ongoing support, BREC will certainly continue to shine. Bill Cocreham … Peoples Health Champion.